Ah, the entertainment trap. It is such an easy one for doting parents to fall into, especially with the firstborn child. I would definitely have gone this route myself if my baby hadn’t sent me a profound and pivotal message in our first RIE Parent/Infant Guidance Class together. For the first three months of my daughter’s life, I’d been entertaining her nonstop, assuming it my duty to occupy and engage her every waking moment with my activity while she remained mostly passive (which is all I thought she could be). Then, following my instructor’s suggestion, I placed her on her back on a blanket on the floor…and to my astonishment she lay there perfectly content for the two hour duration of the class. My daughter’s message could not have been more crystal: Please stop keeping my mind so busy, Momma. I need a little time to think. Taking that giant step back to observe my baby was the ticket to an exciting adventure, because I was then able to begin to know and enjoy my daughter, while also witnessing the physical, cognitive, creative and therapeutic benefits of her play. But even if we do get the memo about trusting our babies to be capable, active learners and allowing them some time to “be”, the toddler years present a whole new challenge. 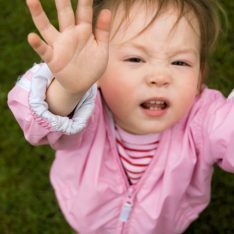 Toddlers are in the process of gaining independence and discovering their power. They are supposed to keep pushing until they find our limits – testing what it takes to make us jump and how high. This is not being “bad” — they’re just doing their job. Taken at face value, our toddler’s age appropriate demands might lead us to conclude, “My child obviously needs me desperately and can’t possibly play alone!” As parents, we may also be reticent to assert our own needs and wishes, because we want to avoid confronting our child’s strong emotions. Either way, we can end up causing our children to “unlearn” to play. Little-known fact: when we sit quietly and are passive, yet receptive and attentive to our children while they play, they feel just as nurtured by our companionship (if not more so) than they do when we are actively involved. It is a profoundly validating experience for children to be able to hold our interest without having to ask or work for it. Without a word of our praise, our appreciation is palpable. When adults play with children in the conventional sense, we almost always end up directing, dominating, or at least altering the course of action somewhat. We also tend to “hook” children on our involvement, which makes their transition to solo play a more difficult, almost foreign concept. Learning to be a play “supporter” rather than playmate takes practice, entails sensitive observation, open-mindedness, acceptance and, most of all, restraint (especially for those more inclined to do than watch). But once we get this down, it is an incredibly relaxing, satisfying, Zen-like experience. When and how should we respond so as not to interrupt self-directed play? We simply take cues from our kids, trusting them to request our input, which they usually do by looking at us or expressing themselves verbally. Then we respond by narrating or “sportscasting” succinctly. What if my child asks for help? Usually, this type of support is all the help children need. Develop routine times for independent play so that separation is easier for your child to accept. I share more about fostering independent play in my new book: Elevating Child Care: A Guide to Respectful Parenting. You get so much across in this post! Reminds me of an experience. I once tried to get a roomful of parents to imagine what it might feel like to be two years old, with passivity imposed in so many ways yet autonomy expected on demand. Talking about it didn’t get the message across. So I paired them up and had one adult role play the parent and the other the child. The parent-actor had several goals to achieve, unbeknownst to the child-actor (somewhat like being a small child) and I gave them ten minutes. Very frustrating minutes for the adults playing the child role! Thank you so much for linking to my article, Janet. I love reading everything you write about independent play! Parenting is such an art, and with every article I learn something new and find a way to improve my relationship with my kids. Thank you! What Janet doesn’t mention is just how difficult it is for some of us to observe. As a dad, with our first child, I’d come home from work craving interaction and connection. My natural compulsion was to suggest and direct games (daddy’s so much fun), whatever I thought would be engaging and fun and bonding. It took some time and considerable restraint to sit on my hands and observe, to learn my daughter’s cues, and finally feel the deep connection forged by simply being present and available. An evolution for me, and (I’m convinced) developmentally invaluable for my daughter. I didn’t attend RIE parenting classes but had the advantage of an in-home tutor. It was much easier the second and third times around. Try to introduce him to “make-believe.” Help him see himself in an imaginary place and time, whether in outer space, or in a less “pc” zone, such as a cowboy with a horse. Shop for toys that will encourage this side of him. As a girl I was always able to find ideas to do myself–with dolls, even with books, with fairy godmothers, etc. Having only one child at this point, I am not sure what I’m in for as he gets older. He is 22 months now and is perfectly happy to play by himself most of the time, although sometimes he likes to play with us. From your experience, do children get more demanding about wanting to spend time being directly played with as they enter their 2s and 3s? My LO is a month older and has become more demanding of us playing with him as he gets older :/ but I’m sure all kids are different! I wondered for a minute there if I’d written to you and forgotten about it, but my LO is only 23 months! It’s true that we doting moms can get a little over responsible for our first born especially if we allow our lives to completely revolve around them. As a mother of two who are now 17 and 19, here are some things to consider however, and that is there is nothing we can or should do about our first borns getting the first born treatment–it’s just what is. Secondly, the individual personality of the child will play a bit part in how demanding they are of our attention. Personality is another aspect of our child’s reality that we cannot and should not try to change. I’ve always tried to be more of an observer than a director and most of the time my 22 mo son will play independently ONLY when I’m there observing him. No, he won’t engage me if he doesn’t want/need to, he’d contently play, but as SOON as I step out of the room (even with letting him know where and what I’m going to do, etc) he’d follow me and starts wanting me to go back and play with him, or he wants to participate on the things that I do. Most of the time, I try to include him, but it is impossible with the many daily chores that I have to do. I’m not sure what I could have done differently. Any thoughts? I’m in the same boat as you with my 21 mo daughter! I’m looking for ideas too! I guess this is where having gates to close off sections of your house is really helpful. They physically cannot join you as you go get busy with a chore. But I’m not sure how I feel about putting up gates at this point. If it’s there from when they’re very small, it wouldn’t feel as “mean” as it does now that they’re used to coming with you. Happily, I’ve being using RIE philosophies since birth, and my 15 month old so far is wonderful at finding his own experiances around our toddler-proofed apartment. He asks for interaction with specific things sometimes, and I’m happy to be led by him. Partly this is RIE, and partly this is because I’ve been a single parent from the start, so have always had to leave him from time to time to get things done. The question I have is related to that last point – I feel I’m there for him when he needs me, but when he’s playing/exploring/working, I am usually using that time to get things done (I also work part-time, so I’m trying to balance son/home/work). When he wants my attention, if I’m doing something that can wait, I’ll be there, otherwise I’ll have to tell him that I’m busy (usually cooking) and will be there soon. I don’t have a LOT of time to just sit and observe since I’ve returned to work. Will my son still feel nurtured when I’m watching and observing as best I can, while also being busy? I used to have more time to litterally sit a few feet away and watch for great lengths of time (so amazing, even as an infant I could just watch, and he could just BE, and we’d be so content), but now I don’t. Maybe once a day I can spend 20-30 minutes just observing, and sometimes in that time he’ll lead some inteaction, and sometimes won’t. Thanks for this post, Janet. I discovered your blog a few months ago and have read everything–especially grateful for your thoughts on independent play, discipline and sharing/etc. It has definitely shifted how I interact with my 2yo daughter–and I am looking forward to using some of these ‘new’ techniques with my second baby, coming in October! My in-laws are visiting now and it’s so interesting to watch their interactions with my daughter through his new lense. They are so enthusiastic and pour a tremendous amount of energy into their interactions with their granddaughter. She adores them and clearly has so much fun when they play together–but they also dominate the interactions and interrupt/redirect to new play activities when she’s contentedly engaged in something. Previously I felt amazed by their enthusiasm–it was definitely not something I could sustain–but now watching it just reinforces this new path I’m on. I think it’s fine for her to have a weekend of those kind of interactions now and then ( they live out of state), but I really do think that my new style of attentive less-is-more parenting is better for my daughter on a day to day basis. Thanks for your guidance! We had the EXACT same problem recently. Although we have been following RIE from birth we somehow ended up in this situation where my 3 year old was NOT able to play ON HIS OWN for even a short time. We went to a family counsellor and the advice we got was: Stop saying things like “I JUST need to do laundry (or whatever) and THEN I will be with you.” Because that way you just keep him waiting. We have a life too and we should continue to live that. 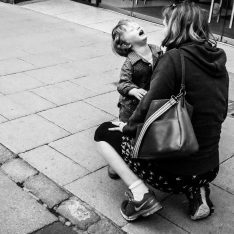 We can play with our kids every now and then but what happened here was: I felt I needed to be at least attentive all day (which lead more and more to entertaining or playful) and I’m allowed to have little breaks for a coffee or cooking. Instead now I realized: I’m allowed to have coffee all day, I’m allowed to read a book or do housework and IN BETWEEN I can follow my child’s invitation to play. Ever since that shift in paradigm (for me it was like that) it is SO much better. And I get so much more done. AND even better: I enjoy playing with him again when he asks me to. Nadine, thank you for your comment. For me, I think I needed permission to live life alongside of him. My son is 2.5 and I still cater to his every whim in such a way that every bit of the necessary stuff doesn’t happen unless he is asleep. Unfortunately he has some sensory stuff that makes most of this dangerously impossible alongside him, but that doesn’t mean everything is or has to be. Holy. Mama this is my life! As i type my 27 month old is rolling around on my lap rather than playing with his toys. My biggest problem is he won’t talk! He knows words, but chooses not to talk. If i try to encourage him to talk he yells, and gets frustrated. I’ll catch him doing his abcs alone in his room, but once he sees me it’s over! He will hang on my pants while doing dishes. If i sit to make a phone call or write an email he climbs me while crying! I am due to have my 2nd angel in 6 months. I am terrified because my 1st was so high needs during the 1st 6 months, and i can’t imagine dealing with both at the same time. We just started time outs. 2 minutes, and then i go and have a talk with him about why he was in time out, and how he can avoid it. So frustrating. It’s making my pregnancy so stressful! Lol help! Janet, thank you so much for this wonderful post! You provide a lot of food for thought here. I especially appreciate, “It is a profoundly validating experience for children to be able to hold our interest without having to ask or work for it. Without a word of our praise, our appreciation is palpable.” How wise and well-said! I just need some advise regarding the safe play area recommended. I have created a safe play area for my 18month old in his room with open ended toys (balls, blocks, pots etc)and a safety gate to keep him from wandering to the rest of the house. When i need to get things done (shower, clean etc) I would take him to his room and sit with him for a while until he is happily playing and then calmly explain to him that i need to go do some errands (or whatever) and I will come back after a while but that he needs to play in his room in the meantime. The moment I step out he just drops everything and clings the safety gate for the entire time crying snot and tears. Its exhausting. Advise please. Iv read many of your articles but I have a feeling that Im missing something. PS. he does the same thing any time I need to leave him at a crèche (for church or other reasons). I feel like a bit of a rookie. Janet, I was so glad to read this–since I’ve ended up doing a lot of this over the years. But one question…what if it’s not 100% attention. I don’t mean sitting reading a newspaper next to kids–reading tends to take a lot of focus, but what about simple knitting or hand sewing/mending. I find that if I’m doing those things while sitting by kids playing, I still tend to pay a lot of attention to the kids, while still getting a chore/project done that I also enjoy a lot. Those things don’t take a ton of my focus. Hi Jane! No, 100% attention is certainly not needed all the time, just in spurts when the parents are able to drop everything and observe. RIE recommends focused attention during all “caregiving activities” (feedings and mealtimes, diapering, bathing, bedtime rituals, etc.) Refueled buy our attention during these regular intervals thoughout the day, children usually get all the nurturing they need to enjoy playing on their own for extended periods. My 15 month old daughter used to play amazingly well by herself. She would toddle around for hours just exploring and playing with her toys and reading her books. For the past month or so she pretty much exclusively plays with and reads her books, which is great, except that increasingly what she wants is for me to read her books literally all day. From the second I sit down with my morning coffee she is bringing me books and becomes quite upset if I don’t get on the floor and start reading. And then continue reading. I say to her “Mama is drinking her coffee so you read your book and when I’m done I’ll read to you”. I’ve tried taking the book she hands to me and placing it next to me and pointing at it saying “you read your book”. But that doesn’t work at all. If I need to make lunch she follows me to the gate we have at our kitchen entrance holding a book out and crying. I have no issue sitting on the floor reading her books and just being there while she plays, but I have no desire to do this all day. How can I gently help her play by herself again? We have ended up in stints like this. Best advice I have is that you’re over thinking it. You are allowed to stop doing something. My son absolutely adores his Curious George books. Some of these books are about 186 pages–as they are 8 stories in one book. One afternoon he had me read about 600 pages of George books–and I got stuck where you are for awhile. At first I was absolutely over the moon that my son, the very same one who cannot yet be still even in his sleep or for a meal just sat for over two hours of story time and conversation about each one. And don’t get me wrong, I’m still impressed, but after a week of every physical George book and ebook on the kindle we could find–I was just plain over George. My son is fine playing alone while i do things, like if i say i need to make dinner. But sometimes i just need to sit and rest, and those are the times he really wants me to play and i just dont feel like I can say no, but then I end up exhausted at the end of the day. I know its more me that has the issue (he doesnt get upset or anything, but will repeatedly ask me to play), but I have a hard time saying no when I really do want to play and have no pressing needs except resting. It sounds like you do have a pressing need: resting so you can be more present later. Great article. I enjoy your insights and am doing my best to implement a gentle parenting style with my children 2.5 and 1, that respects both them and my husband and I. My 2.5 year old is a great self entertainer- my biggest struggle is that there are two. And while the older entertains herself, our biggest struggle is teaching her to use words instead of throttling her young toddler brother. I can’t leave them alone in a room together yet. I’ve tried and it seems too much for her and dangerous for him! I’ve found a lot of parenting literature that gives me great advice on teaching one child but few that help me incorporate that advice when there are two young ones. Surely I’m not the only one struggling with this? There are articles on hitting, biting and sharing- bit general existing and playing and trusting. Please help! Thank you for this post and for re-highlighting on Facebook today. I have a question similar to a few others that have been posted here (and our children seem to be around the same age): what do you recommend for a mama of a 15 month-old who, b/c of our intentional RIE practices, played really well by himself as a baby, and plays well when I’m near him and attentive, but objects to his parents doing any chores, trying to sit down and eat, etc.? The moment we start getting dressed or cooking dinner or eating it (we don’t always get to eat at the same time he does), he’s desperate for our attention. If we speak to him respectfully about needing to do something now and ask him to play by himself, there’s a meltdown. He’s such a young toddler that I’m not sure how much he understands, or what to expect of him. Thanks in advance for any advice! I am not trying to diagnose him or anything, but I am saying if you feel there’s a lot of struggle despite your constant respectful approach, there might be something going on to justify it. So, wherever or however he is being encouraged to be by himself may be the clincher here. I also found if I was cooki g dinner he was already hungry and tired…so, sometimes I changed dinner plans because he would be far too upset to make it through the cooking I intended…maybe not everyone would do this part, but the fact is, I couldn’t expect him to be contented if he had an unmet need. Great article. Just a quick question I would really appreciate someone answering. Do you keep your 18 month old in a gated area to encourage independent play even when they resist it? My son stops playing the moment he sees me doing something in the kitchen and just follows me around everywhere. Thanks for this article. I need some help! I have a 2 yrs and 3 month old son. He is our only child, and we live with my parents. he also has his own nanny as we both work full time. Everyone is very about him and I know we likely have “smothered” him with attention. He has become unable to really play with his toys, (which are likely enoguh to stock a toy store) for any time more than 5 mins. He seems to be just asking for one thing after another all the time. We started him in nursery, and he doesn’t cry when dropped off – however he cries blue murder when the class is doind something he doesn’t like. I’m told he wants to have the teacher with him most of the time by his side….what can I do at this stage?? Help!!! Yes thanks for this. Wonderfully hands on as usual. This is definitely what I need now. I’ve found gardening a great place to start. One added bonus is that getting really really dirty is allowed to. So much to explore in a garden this time of year. If I stop and smile broadly at my 2.5 yo son, when he asks for my attention, and really look him in the eye, and acknowledges what he wanted me to see, that usually is all he is after, and he will then got back to being absorbed in his work for another 5-15 mins. But I have much more to learn… So thanks for the reminder. We have a 23mo girl who does not play with toys or anything else, she wants us to play with her, well, mostly my husband. She likes to play “follow-the-leader”, her being the leader and my husband copying what she does. The only time she sits mostly by herself is the 1-hour/day where she is allowed to watch Finding Nemo. Even in playgrounds she wants us to play with her. Our daughter spends 9.5 hours at day care 5 days a week, and part of me thinks that her demanding out attention for the 3 hours she spends with us is only normal, but at the same time, I have chores to take care of when I get home. Erika – there’s a great difference between “attention” and “entertainment”. I agree that your daughter needs periods of your undivided attention while she plays! But I would consider being more receptively attentive and less of an entertainer, game leader, etc. It’s perfectly okay to say, “I will stay here on the grass and watch you play”, (and then really watch her), rather than going everywhere with her and entertaining her. This is still “playing together”, but it is more child-centered, and will be far more creative for your daughter…and it will also help her transition to be able to play more independently while you do chores. Fantastic post! I’ve always had the mindset that activities my son and I do together should be mutually enjoyable as much as possible. That means we cook together, do crafts, read, run errands, go to the park, play board games… lots of fun things! But I’ve never been interested in playing duplos with him or building train tracks, playing “house” etc. Sometimes I’ll help him “set up” but then I leave him to it. People always marvel at his imagination and how well he plays! My only secret is that I have him play alone for a couple hours each day; amazing what such a simple thing can do for a child’s brain! Thanks for this post. So, I always took this approach with my older son (now 4.5), because it was consistent with my training in non-directive play therapy… Perhaps coincidentally, he developed a host of developmental concerns, particularly deficits in social and play skills, and I can’t help but wonder if they are connected – especially as teachers and therapists advise me to insert myself more in his play so that he is better able to play with peers who may not always do exactly what he wants (he plays well with peers in unstructured, outdoor play, but when indoors with toys will always choose to play by himself over negotiating with others). So… Just wondering if you have any commentary on this, or any suggestions regarding his younger brother, now 14 months. Hi Emily! I have never heard (or experienced) that fostering self-directed play creates these issues you speak of. Has he had much peer play experience? One-on-one play will probably be more beneficial for him than groups. I’m also wondering if his need for control around play could be about his transition to becoming a big brother, since there is a HUGE loss of control involved in that experience. If you want to try inserting yourself more in his play, I don’t believe that you would hamper his self-directed play ability at this stage of the game. Thank you for this! My kid is just this kid, and I’m just that mom. The receptive yet passive idea of interacting with a child is SO spot on!!! Thanks so much for sharing. This all makes so much sense. I sometimes feel kind of guilty when my 2yo has to play all by herself. I found some very helpful suggestions here. I have a question, I just recently adopted my daughter out of foster care…she is 3 years old and seems incapable of creating any play on her own without hijacking my 2 year old son’s (also adopted but he has been in our home since birth) games, either by taking his toys or putting her body in his personal space. She watches his self-selected play almost with a hungry, jealous look. Many times, he is content to play with her, but I want her to feel comfortable to play by herself as well. She either has to be touching me or my husband or involving herself in my son’s games. I have begun to set aside times where she must find her own game to play and stick with it for a set period of time. Is there something else I can do to encourage the development of her imagination? She is only 3 but I see some earmarks of ADHD. What can I do to lengthen her focus? Regarding your 2-year-old, I would give him lots of room to handle his new sibling himself, and intervene as little as possible. The two children need to learn to set their own boundaries and develop their relationship. Sadly, these strategies have never worked with my son. He often acted as though lying on his back with or without a play area was a death sentence. He has always been exceptionally demanding. He wants 100% one-on-one attention. Mad an almost 3 year old, I hear “mommy, play with me!” No less than 100 times a day (literally). I try to play as an observer and this fails to work. He starts screaming “you’re not playing with me!” It’s exhausting. I’ve failed somewhere. Consequently, it’s really exhausting playing with him. My daughter is exactly the same. As a young infant, I could not place her on the floor (or anywhere) for even a second without her screaming bloody murder. She insisted on being held constantly, and even then she needed to be actively engaged. She is almost 3 now and hasn’t changed a whole lot…and all of these “great strategies” don’t work for her either. For example, if I try to play as an observer or tell her that I will sit on the floor and watch her, she gets extremely angry and screams that I am not really playing with her. She wants active engagement and participation constantly…and this has little to do with dependency in terms of not knowing how to play. She is extremely imaginative, directs her own play and comes up with all kinds of elaborate games and role playing scenarios on her own…but, nevertheless, she still wants someone to play with her. And throughout the day, no amount of firmly telling her that I need to do something else will stop her from whining/crying all day long and begging me to play with her. She is exceedingly clingy, extremely intense and unbelievably persistent. I am interested in the advice that Janet Lansbury would have for a highly sensitive, spirited child…because, frankly, her advice seems rather out of touch for those of us in the minority with children of this particular temperament. I actually laughed out loud when I read about her experience of placing her daughter on a blanket and her daughter being content for the entire two-hour duration of a class. NEVER would have happened with my daughter…she wouldn’t have been content for even two minutes. Anyway, I didn’t mean to go on a rant here, but I just find it frustrating to read parenting advice that seems to assume that all children have similar temperaments, and therefore certain methods will work for all of them. I am now a grandmother and read this because my grandchildren are so unlike my kids. They need to be occupied every minute when with their Mom, but when with me they do not. Looks like without knowing it I raised my children to be independent and happy! I will pass this on, Thank you!! Dear, I am the one who made a mistake. Me and my husband are a bit older parents and we were so happy to have a baby. Since she was born she was entertained all the time, actually now I see we were entertaining ourselves. She is now 3 and I have to work but she doesn’t want to spend not even 5 minutes without me. she is not independent and she doesn’t even want to go to school. is it possible to we can fix the mistake we made and how.. we are so exhausted and tired all the time and me and my husband we don’t have time for us she is always there, sleeping with us etc. please help us.. what should we do..i find out now about this method.. thus I am afraid it is too late. Thanks Janet. Ok not to late for boundaries I will do that. Is there any course that I can have or some good book that You can recommend. I would like to improve her self confidence and independence also.. Thank you SO much for this post. A friend shared it with me as an introduction to your work and it is changing my perspective so much. 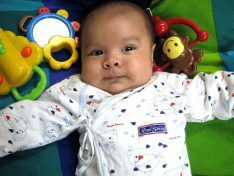 I didn’t realize how many things I was doing that were contributing to my son becoming more dependent, rather than independent. I just bought your books and am starting to read them. But hoping you can answer these two questions. I’m trying to transition to this type of play – the less intrusive type – but my son keeps insisting that I play with him the way he wants me to. He’ll be playing with his cars and hand me a car and point to the floor, indicating he wants me to drive the cars with him. Or something similar with a different toy. He’ll keep doing it until I do what he wants and get really upset if I don’t. Should I just let him cry? I’ve tried saying something like “I hear you crying, I know you want me to play with you like we usually do, but we’re trying something different,” but it doesn’t seem to help. He’s so used to me playing with him most of the time (he’s 18 months, and up until 17 months, we all lived in one room in my mother’s house so that close quarters got him used to being right next to me all the time)… Suggestions? Another question is, does your philosophy about not entertaining your toddler change when they are sick? He doesn’t seem to have the energy to play by himself very well when sick/teething/in pain. He seems to want to be in passive/receptive mode more and want to play or sit with me more. This feels normal to me, but I’m not sure where the line is and don’t want to “entertain” him too much on these days because we’re really trying to transition away from that. What do you suggest when the child is sick? Thanks so much! Janet, I have gotten so much out of your website and I am very thankful for being relieved of the burden of entertaining my child. My current difficulty though, is that my almost-three-year-old daughter wants to “help” with everything–kitchen work, laundry, changing toilet paper roles, stuffing bills in envelopes, opening the mail, you name it–she wants to be right there doing it all, and often taking charge, and I’m exhausted. It’s gotten to the point that, as much as I love her, I am desperate for space and to be able to just get things done at a normal speed. If I give her the “shuck corn or play” option that you suggested, she will choose “shuck corn” all day, every day, and every fiber of my being wants to just shuck corn in peace. For now, I am setting up times where she is not allowed in the kitchen, and she will begin to play happily, for a few minutes. But as soon as she is allowed back in my company, she is incessantly asking to help me with everything and/or she is incessantly commenting on everything I am doing–it’s her own way of being constantly entertained, even though she calls it “helping”. Any thoughts? Thank you, Janet! I really appreciate your reply. I am at a loss. I’ve been trying to do exactly what you write for quite some time now but I am at the same point I was at the beginning. I tell my almost 3 year old son exactly what you write and he of course gets frustrated. The problem is he starts having a big tantrum, screaming throwing things, trying to hit so I have to take care of him and talk with him to calm him down (not being able to do my chores). When he is ok again everything starts again. He wants to play with me and I have to tell him I have to do some work before I can play with him. My kitchen always looks like a battle field! I really don’t know what else I can do. My 5 year old daughter will not entertain herself at all. I’m so overwhelmed. I have tried the above mentioned stategies but the more I try to say that I need to do housework or it’s time for you to play with your toys the more clingy she becomes and sometimes even physically attaches herself to me – hugging me or wanting to sit on my lap whilst I do our online grocery order. When we do play together the only games she is interested in playing are role-plays that involve me being various characters from her favourite shows and going on adventures where we fight the baddies or she saves the day. Up til not too long ago, she was an only child. Is this just classic only child behaviour? Is it age appropriate? Is there anything else I can try? This is how she has always been and not the result of the new baby. I have a 2 year old and a 4 year old but just recently came across your website and the RIE approach (which I love). I’m hoping it’s not too late undo some of the damage that we’ve done! Our children both have very short attention spans. After listening to your audio book, I really feel that this was caused by our need to entertain them all the time. We’ve also allowed them to watch TV or use the iPad while we work (I work full-time but do work from home on some days). Neither of our children will sit long enough to color an entire picture or do an entire puzzle. I feel like this is inhibiting my daughter’s ability to learn in her pre-school. How can we break the bad habits of TV/constant entertainment at an older age? Thank you! My firstborn son, who is going on 4 now, has always been quite demanding of my attention. I do apply these principles of independent play, but with little success with him. His younger sister (nearly 2 years old) plays wonderfully on her own. If I do tell my son I will be cleaning up the kitchen (for example), the minute I leave the room he hurts his little sister to the point where she cries hard. I come back in the room and comfort her and while I tell him that we don’t hit, kick, etc., I try not to give him attention, as I feel that’s what he’s after. He will smile after hurting her! This has been going on for the past year now, and I’m at my wits end. I get nothing done during the day, as I’m constantly comforting my abused 1 year old! I’ve tried separating them, and he screams so loud for so long that she ends up sobbing in her separate space and looking terrified. Help!! What can I do to break this cycle? He has always been attention seeking, but it has increased 100 fold since she was born (not to get graphic but he started holding his stool the week we brought her home). What can I do to help him?? And our family? Very helpful article for grandparents too. Our 3-old granddaughter and our son spent a week with us. She continuously asked me to play with her from the moment we got up. Every outing we went in, she demanded I play with her when we got got home, she demanded I watch some videos with her and I spent a few minutes doing so. She turned her head to watch me instead if the videos to make sure i was watching them. When I looked away, she told me to watch the video in a loud voice. I politely told her I had to do some work in the kitchen. Next time I will use the pointers you suggest. Yes, I would try being clear and confident about your boundaries, and please let me know how that works. My daughter is 23 months old. Since she was born she’s had health issues like reflux, milk intolerance and hip dysplasia that have meant a lot of holding and hugging and physical closeness. The hip issue meant that from 7.5 months till 10.5 months she was in a full body cast (up to her armpits), then she was in a brace full time for 6 weeks during the day. All this meant she needed a lot of cuddles and holding all day long. She is now a very demanding attached toddler. She wants to play with me all day and if I try to start her on play she likes and back off she loses it. Crying and grabbing me. She often says what she wants to play but is in tears if I try to back off or even sit there and interact less. She often gives me things to do ie: if we play playdough she tells me to make the birthday cake and she makes the candles. So she initiates and directs play but I can’t get any independent play from her. Anything she’s interested in has to fully involve me. She is the same at her part time daycare. Needing the teachers touch and attention constantly. How can I help her?